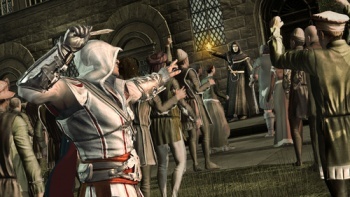 Ubisoft has clarified a few details about the DRM in the upcoming PC version of Assassin's Creed 2, reassuring gamers that they don't need to worry about it because... Well, just don't worry about it. A brief rundown to make sure everyone is caught up: In January, Ubisoft unveiled a DRM scheme that will require all its future PC releases to be connected to the internet and logged in to ubi.com in order to run. A few days ago, it was revealed that the scheme was somewhat worse than that: Games will have to be connected to Ubi's servers full-time while they're running and if the connection is broken for any reason, the game will come to a screeching halt. In case that's not quite infuriating enough, any progress made since the last checkpoint or auto-save will be lost, too. The backlash, as you might expect, was swift and vicious. In response, Ubisoft attempted to clarify the plan to Ars Technica, assuring gamers that they really don't need to worry about the new DRM requirements, even though they're pretty much exactly as crazy as reported. "As long as you do not quit the game, the game will continue to try to reconnect for an unlimited time [if the net connection drops]," a company rep said. "Once the game is able to reconnect, you will immediately be returned to your game." "Where exactly you are reconnected in the game may differ from title to title," the rep continued. "Settlers 7 reconnects at the exact point where the connection was lost, AC2 reconnects you at the last checkpoint (and not the last auto save, as indicated in the CVG article). There are many checkpoints so you're back to the point where you got disconnected in no time." The rep said players will only be dropped out of the game if the disconnection is "lengthy," whereas if it's only down for a couple of seconds, the game will simply pause and then resume once the connection is reestablished. Fluctuations in speed shouldn't be a problem either. "Our online services platform will require a maximum of 50kbps of available bandwidth, so even with the slowest connection, gameplay won't be affected," the rep added. Well that certainly makes me feel better. How about you?